Each Evoke App has three (3) reserved Entities that cannot be deleted and must be mapped to a database. These are the AppUser, AppUserGroup and Classification Entities. In addition there is one mandatory database file, EVLU, that is not mapped. For apps using a new database then these files/tables are simply created in the database with the properties listed in these pre-defined entities. For apps using an existing database the properties/fields are to be mapped to different database tables and fields for population. The AppUser Entity is primarily used to hold the user records for authorised users of the App. The AppUser table/file is for the User Groups, User Name, Password and Login Information associated with users. AppUser Entity records (data) is/are populated from one or more tables/files held in the repository (database) associated with your App. The AppUser table/file works in conjunction with the EVLU licensing table/file. Account - Not Mandatory - A String or AlphaNumeric field - can be used as part of the login process to your app to hold an account name that can be used in conjunction with the login name and password - Not currently used in standard Evoke App login processing. 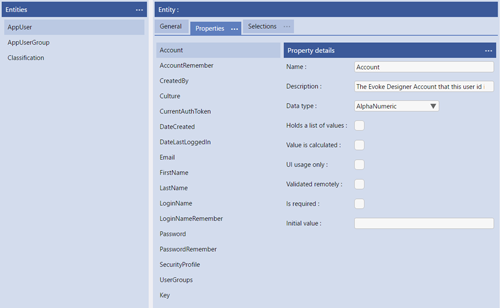 Account Remember - Not Mandatory - A boolean field - UI only so not mapped to a field in the table/file in the repository - used by Evoke to create a "cookie" on the device that that the app is running on that will hold the Account locally so that it can be pre-populated during the login process - - Not currently used in standard Evoke App login processing. CreatedBy - Not Mandatory - A String or AlphaNumeric field - can be used to hold details of the user that created this AppUser record. Culture - Mandatory - The Culture property (field), in the AppUser record (entity) for each user, can also be set with the value from the Table of Language Culture Names, Codes, and ISO Values. Adding en-US into this property (field) will cause the date to be displayed in the MM/DD/YY format and the currency symbol used to be $, if you added en-GB in the Culture property then the date, in the running app, will be displayed for that user in the DD/MM/YY format and Â£ to be the currency symbol. If you do not set the Culture property (leave it blank) then the users culture (date format, currency symbol, etc) will default to en-US (USA format). 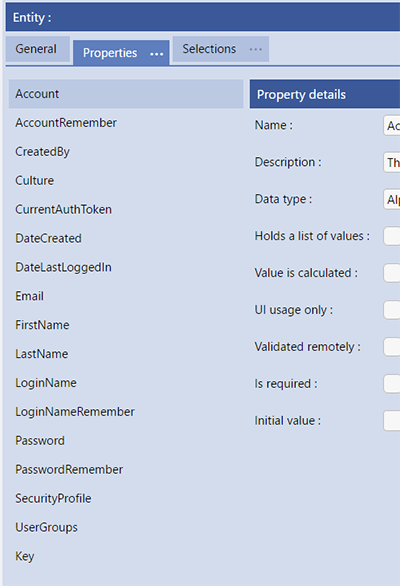 When user records are created from within your app this property (field) you can use a Culture Classification to further refine the Culture - Set the property in the AppUser entity to be a Classification and then use a Culture Classification to set the Data Format and Currency options for a user beyond those available in the ISO values table. CurrentAuthToken - Mandatory in the Entity definition but does not need to be mapped to a real field in database file - A String or AlphaNumeric field - for future use, not currently used by standard Evoke processing. DateCreated - Not Mandatory - A date field - can be used to hold the date that the AppUser record was created. DateLastLoggedin - Not Mandatory - A date field - automatically updated by Evoke, if present in the Data Mappings and indicated to be used, to hold the date that the App User last logged in to the App. Email - Not Mandatory - A String or AlphaNumeric field - can be used to hold the email address of the User. FirstName - Not Mandatory - A String or AlphaNumeric field - can be used to hold the first name of the User. LastName - Not Mandatory - A String or AlphaNumeric field - can be used to hold the last name of the User. LoginName - Mandatory - A String or AlphaNumeric field - used as part of the login process to your app to hold the users Login name that is validated as part of the standard Evoke App login processing. loginNameRemember - Not Mandatory - A boolean field - UI only so not mapped to a field in the table/file in the repository - if present used by Evoke to create a "cookie" on the device that that the app is running on that will hold the user's Login name locally so that it can be pre-populated during the login process as part of standard Evoke App login processing. Password - Mandatory - A String or AlphaNumeric field - used as part of the login process to your app to hold the users Password that is validated as part of the standard Evoke App login processing. The authentication method for the password is set in the App Settings section of each App Design, by default a simple match authentication is included and used. Password Remember - Not Mandatory - A boolean field - UI only so not mapped to a field in the table/file in the repository - if present used by Evoke to create a "cookie" on the device that that the app is running on that will hold the user's password locally so that it can be pre-populated during the login process as part of standard Evoke App login processing. Security Profile - Not Mandatory - A boolean field - UI only so not mapped to a field in the table/file in the repository - for future use, not currently used by standard Evoke processing. UserGroups - Mandatory in the Entity definition but does not need to be mapped to a real field in database file - A joined, linked or embedded entity field - if present used by Evoke to provide access control for security and unique navigation by user. Please refer to AppUserGroups description below. The App User Group Entity is used to hold the User Groups used in Evoke's Access Control system. It is populated, by default, with the UserGroup Classification and can have multiple entries. The entries should match those set up in the Access Control setup. User Groups - Not Mandatory - An Alphnumeric or a Classification field - if used as a Classification it contains the "User Group" classification. Classifications are static lists used to populate a field/property of a table in the UI design of your app. e.g. to provide a drop down selection of product names, standard responses to questions, etc. It is probable that you will want some of the Properties (data entry boxes) in your App UI to be populated by the App User selecting from a drop-down list of options. In Evoke these are "Classifications". 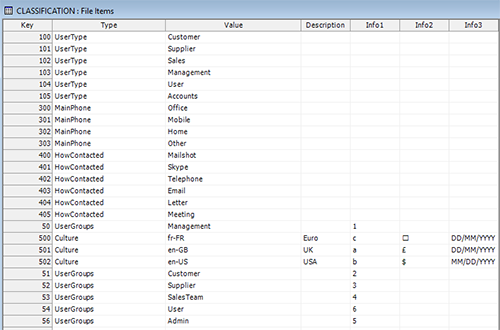 a fixed list that you define in your database. Code - A String or AlphaNumeric field - holds the Classification option or value for the drop down, multiple entries equal multiple options/values in the drop down. Description - A String or AlphaNumeric field - holds an optional description value. Info2 - A String or AlphaNumeric field - a free format field except for the classification culture. Info3 - A String or AlphaNumeric field - a free format field except for the classification culture. The Culture Classification, by default, is used to set the Data Format and Currency options for a user and is defined as follows: 'code/value'= region code i.e. en-GB for UK, en-US for USA, en-AU for Australia, fr-FR for France, etc, description'=currency name, 'info2'=currency symbol and 'info3'=dateformat for this user e.g. MM/DD/YYYY, DD/MM/YYYY etc. Culture is used in the AppUser Entity. The common Culture codes (including UK, USA, Australia, etc) are included as defaults. Further cultures OR if you need to redefine a culture can be added to your Classification file as shown in the image. The User Group Classification, as seen in the image on the right, is used to set the user groups in the AppUserGroup entity. The data in the Classification file will contain as many entries as you have user groups set up in Evoke so that these can be selected and used when updating user records. The licensing terms of Evoke require that you create a very small table/file within your database called "EVLU". This file/table is used by Evoke licensing and users of your app will not be able to log into your app if it does not exist or correct entries in the table/file do not exist. 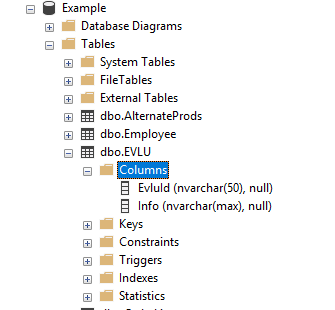 You do not need to include it in your app Entities or complete the data mappings for this table/file BUT the table/file must exist in your database and, in a SQL database, have columns named as below. For each valid user of your app (usually these are AppUser records) then an EVLU file entry must exist and contain, in the key field, the username in lowercase. If you add AppUser records through your Evoke App then a corresponding EVLU record will be created with the correct key. For MultiValue databases, you need to create a file called EVLU. No dictionary items need creating.